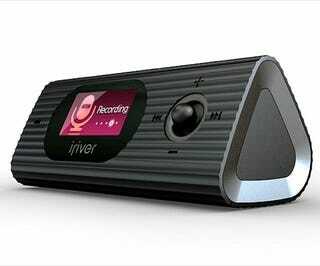 This is the latest DAP from Iriver. The T50 is 2.8 inches long, weighs 1.1 ounces, and can store up to 1GB of MP3, OGG, or WMA files. I don't know why it is triangular, but it is. Maybe DAPs taste better if they're triangular, or perhaps they blend better. This is such a hideous product that I am wondering whether it is an early April Fug—sorry, I mean April Fool. I know it's not the first triangular DAP, but Iriver, what were you thinking? It reminds me of an mid-80s clock radio made by Alba or Saisho. Two AA batteries will give you 52 hours of playtime and it will cost you $80 from Japan. To be honest, it looks like the sort of toy that Gareth from the British version of The Office would have on his desk. There are a couple more pics after the bump.